NOTE: Headpiece band is smaller and a different color than pictured. When you think of the prince of a vast desert, most people come up with few images. They are limited by thoughts of a few famous princes who’ve dealt with sultans and genies and faced both poverty and wealth at once. They… basically only have one. It’s Aladdin. It’s pretty rough for all the other desert princes that lead their own pretty fascinating lives and face all sorts of intriguing choices. The desert is a huge place, after all, but you get one giant blue guy singing and dancing and all of a sudden the entire population of desert royalty goes forgotten. It’s not fair! It’s outright rude! But, we’re trying to shift that focus and reveal some of the worldly sheiks that haven’t been able to leave their mark on the world quite so profoundly, only because they haven’t had the luxury of entering a magical cavern and finding an imprisoned genie that bequeaths all at their beckoned command! There is question about whether or not Sinbad counts among the desert princes. He is, after all, often thought of as a sailor, but still very much a desert-dweller. The bigger question is whether he’s a real prince or not. Then again, neither was Aladdin and he seems to get to hold the royal torch! The Prince of Thieves, the Sheik of the East, and all sorts of others have tales that are far too often forgotten. But, you can change that cycle. Don this Desert Prince costume and you can make your own mark on the world. 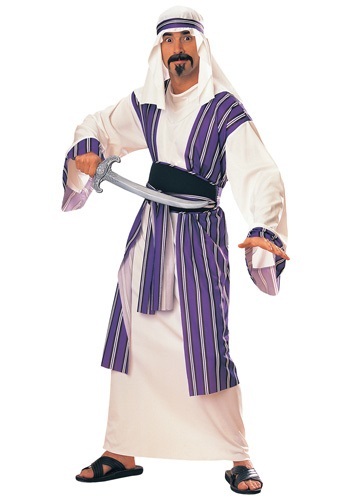 This white robe has an attached purple and black tunic and a matching black and purple striped belt that will immediately distinguish you as a wealthy and royal man of the desert kingdoms. Purple is, after all, a pretty difficult dye to find in the middle of the sands! The two part headpiece is a white cloth and purple headband that function as the crown on the deserts—very cool in all definitions. Accessorize yourself with a scimitar, a sultan’s scepter, or even a magical lamp—there is more than one genie, too, after all—and you’ll have a magical, whole new world to explore!